Our FREE multiple choice UK signs test for car drivers utilises the official DVSA practise questions, answers, and explanations. The official DVSA Theory Test is the one all car drivers must pass before they can book a driving test. We have designed this free UK road signs test so that you can practise and get an idea of what types of questions will be asked on the actual test. Our free practice road signs UK test is designed to test your knowledge of the road signs in the UK. Questions are created using the road signs manual. This video was made by our team to help you prepare for the traffic signs test. We hope you find this information helpful! This animation was made by our team to help you prepare for the UK road signs test. We hope you find this information helpful! 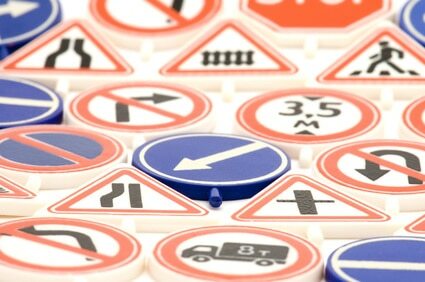 This traffic signs video consists of 30 mixed questions from content areas on the actual exam. We hope you find this information helpful! All answers include a short explanation and reference to the UK Know Your Traffic Signs handbook 2019 or special notes for additional reading on the subject. Traffic signs play a vital role in directing, informing and controlling road users’ behaviour in an effort to make the roads as safe as possible for everyone. Practise makes perfect and there’s no time like the present to start practising for your traffic signs driving theory test online. If you are looking for a trusted way of prepping for your UK signs test, you are in the right place. The signs mock test questions are completely free. They have been developed to guarantee an increase in your chances of passing the actual exam on your very first attempt. Passing the exam to get your licence isn’t easy it takes a lot of studying, preparation, and hard work. Here are free practice driving tests that can help you ace your theory test and be on your way to the open road. The majority of students taking the written test are anxious to start driving. Such anxiety can actually interfere with a student’s analytical abilities. The interference affects the way the students interpret test questions. The students, therefore, end up giving incorrect answers to the questions, resulting in failure. Traffic laws are a fundamental requirement for every driver to understand and practice every time they are behind the wheel. These laws form an integral part of the written permit test. Many student drivers only concentrate on learning commonly used road signs and road laws. They do not take a keen interest in reading the drivers’ handbook. Their lack of knowledge in this area can often result in failure. While a variety of tests can make any student apprehensive, driving students suffer from unnecessary tension and fear. They have grown increasingly tense and fearful before they’ve even had an opportunity to begin the examination. This fear can be caused by exchanged experiences of others who previously failed the driver test, excessive worry about how others will react, or other consequences of failure. Frequently, students find it hard to explain their practical experience in written form. This may be because they have little understanding of the keywords used in driving. As a result, they end up avoiding questions or giving responses that do not reveal the true depth of their knowledge. While the requirement for students to pass the written test before obtaining a driving licence can be challenging to meet, it is still reasonable. Students may assume that cramming the night before will work in their favor. However, they are far more likely to avoid failure when preparing for their written permit exam if they remain calm, take their time to understand traffic laws, take road sign practice test, keep a reasonable view of the task at hand, and practice putting their driver knowledge into words.